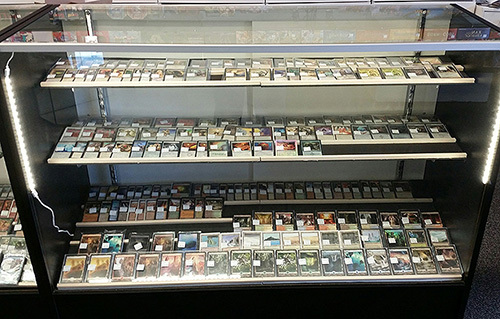 We stock over 100,000 Magic: the Gathering cards at The Relentless Dragon, including over 2,000 premium rares, hundreds of mid-range cards, over 15,000 “dollar rares,” and approximately a gazillion “bulk” commons and uncommons, all organized to make your life easier. The above is one of our four “premium” cases which consist of two Legacy cases, one Standard case, and one Foil case. These cases are home to over 2,000 cards, mostly rares, with a few high-value commons and uncommons in the mix. These are our “dollar rare” boxes, holding over 15,000 rare Magic cards with between one and over a dozen copies each. 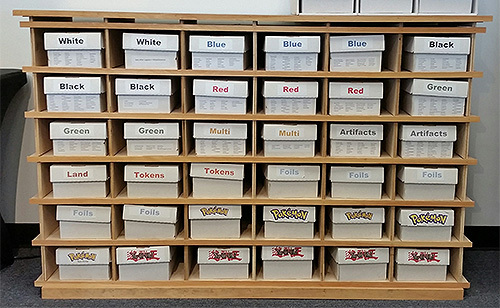 The boxes are organized by color, set, and then alphabetically, so you can find the card you need in seconds. 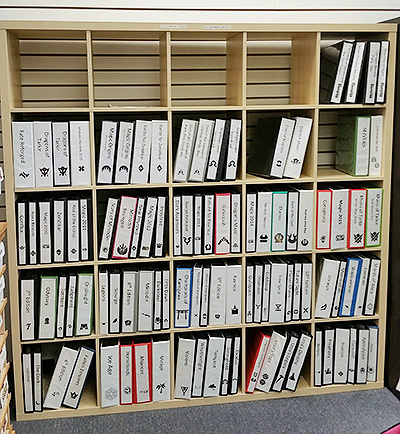 Our “High Demand” binders hold hundreds of mid-range Magic cards all organized alphabetically by color. Just flip to the right section and find your card there. Looking for a more run-of-the-mill common or uncommon? 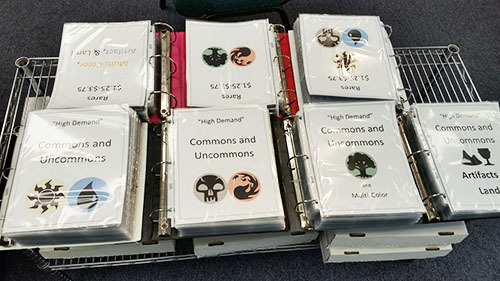 Our bulk binders hold many, many thousand commons and uncommons. They are organized by set, color, and then alphabetically.